When it comes to foundations, it’s all about the soil. The ground where you dig your foundation is the most important factor to consider when diagnosing structural issues. Understanding what impact the soil has on your foundation is one of the keys to identifying possible problems. The soil beneath your home goes a long way toward determining the environmental stresses that affect your foundation. Some soil acts like a shock absorber, while others shrink, expand, separate, and in other ways transfer the pressure to your foundation. According to numbers compiled by the American Society of Civil Engineers, expansive soil has done significant damage to the foundations of almost one-fourth of all homes in the entire United States. This is a startling statistic to be sure, but it’s more than just numbers if you live in Texas. Far too many homeowners in Texas have experienced this firsthand. This is because The Lone Star State is permeated with expansive soil. This means that the soil beneath many homes is full of clay. After a rain, when water attaches to the clay particles, the soil under your foundation can heave and expand. Typically, the result of all this shifting is excessive pressure on the most important part of your home. Then, after the rainwater inevitably evaporates, the clay particles in the soil begin to move closer and closer together. The result of all this movement is a shrinkage in the overall volume of the soil. This shrinkage can put an extraordinary amount of pressure on the foundation of your home. In fact, expansive soil can exert up to 15,000 pounds per square foot of pressure directly on a foundation. It’s difficult to imagine what this much pressure actually means, but rest assured that it can create cracks and lateral movement in your foundation. 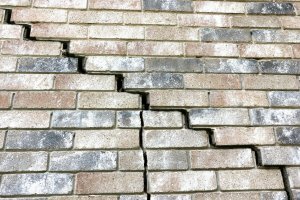 These factors pose a very real threat to the structural integrity of your home and have made foundation repair in Dallas all too common. Moisture expansion is another danger you have to watch out for. Although weather and many other factors can affect the foundation of your home, moisture expansion is by far the most common cause of serious structural damage. It typically happens during the winter months, when cold weather causes the moisture in your soil to freeze and expand. It’s this expansion of soil that causes most of the cracks, spaces, and separations that you see you see in your home and foundation. Periodic detailed inspections are essential to maintaining the health of your foundation. In an important way, your foundation is just like your body: an ounce of prevention is worth a pound of cure and a heck of a lot cheaper to boot. In the next few sections, we’ll tell you everything you need to know about inspecting your home properly. No matter what the cause of your foundation’s symptoms, it’s important to know the difference between a house that’s settling and one that’s starting to crumble. Like with most aspects of your home, early detection is the key to minimizing the cost of foundation repairs. Recognizing the telltale signs of a foundation issue early can mean the difference between a repair that’s easy on the bank account and a total foundation replacement. It can be difficult to know when you just have cosmetic damage and when it’s time to call in an expert. But that’s the exact purpose of this guide: to inform homeowners and help them make these important decisions. Fortunately, a little knowledge goes a long way when you’re inspecting your foundation. You can start by learning the signs of a possible structural issue. In the next few sections, you’ll read about exactly what you’re looking for and where you might find it. You don’t have to be a foundation repair expert to spot some of the early signs of structural damage. All you need is time, effort, and your powers of observation. If you combine these three things with the following information, you’ll be able to take the temperature of your home’s foundation accurately. Start the inspection on the outside of your house. Check to see if your foundation is straight by looking at it from corner to corner. Take note of whether or not the walls are straight, both vertically and horizontally. If any of your walls appear to be leaning, use a level to make sure. When you’re done examining the foundation directly, look carefully at the rest of the house’s exterior. Be on guard for bulges, curves, or divots in poured concrete walls or block foundation. You’ll also need to take note of any areas in the foundation that sticks out further than the rest of the wall. Cracks in your exterior bricks can also be a cause for alarm. When you’re finished with the outside part of the inspection, take a stroll inside your home. Intuitively, you might think that foundation problems will be most evident on the exterior, but many of the more obvious signs are inside. Start the interior inspection in your basement or crawlspace. This is the area of your home where structural issues are often most apparent. How does it smell down there? Does it smell stale, moldy, or damp? A musty odor in your basement or crawlspace can be a strong indicator of a foundation problem. Musty odors are typically the result of a leaky basement or crawlspace. One of the most common causes of these types of leaks are cracks in the home’s foundation, so be wary if these areas of your home smell damp. High numbers of insects in your basement can also point to a foundation problem. These critters are not a danger in and of themselves, but because insects are generally attracted to excessive moisture, a large number of them should put you on the alert is well. Continue the inspection by going through every room in your house. Be on the lookout for cracks, separations, and splitting. If you notice any of these structural abnormalities, be prepared to take a closer look or call a professional. Vigilance is the key to avoiding complete foundation replacement and other costly repairs. As we described above, the best way to defend yourself is to do systematic home inspections periodically. While these purposeful inspections are a great way to spot foundation issues early on, you can protect yourself on a daily basis by simply being observant. In this section, we’ll discuss some of the more subtle symptoms of foundation issues. The floor of your home is one of the most common places where foundation damage is visible. Keep an eye out for cracks in your floors, tile, and vinyl coverings. Uneven or sloping floors are also a cause for concern, as are any spaces of separation where the floor meets the wall. Your walls might also show evidence of foundation damage. If they start to bulge, bow, or lean in, you might want to take a closer look or call a professional. Structural damage can also cause walls to separate from doors, windows, floors, and ceilings. Also watch out for any cracks in your walls, especially near the ceiling or other seams. Symptoms can also appear in your windows and doors. These are often more subtle than the signs that appear in your walls and floors, so stay on guard for any changes you notice. An obvious sign of structural stress is when doors or windows no longer fit in their frames properly. You’ll know this is happening if they become difficult to open and close or if separation occurs. So far we’ve been discussing the most general characteristics of foundation issues. In this section, however, we’ll tell you how to spot them in foundations made of specific materials. It’s a given that the structural integrity of your home depends on the health of your foundation, but different materials are vulnerable to different types of environmental stress. Every foundation is different. How your foundation responds to various forms of environmental stress depends on the material it’s made of. Knowing what to look for in your specific material will make your inspections that much more efficient and effective. Here’s how to spot problems in the most common foundation materials. Stone foundations are often prone to major leakage. One reason for this is that stone foundations are typically very old. Most were built in the days before compliance codes and proper drainage systems. The lack of a drainage system allows water to pool up against your foundation, resulting in mortar erosion and a wet basement. Because they’re typically quite stable, pier and beam foundations are very popular in some areas. This does not mean, however, that they are immune to serious structural issues. Here are some of the symptoms you should look for whenever you inspect a pier and beam foundation. Sloping or tilted floors often point to structural problems in pier and beam foundations. Doors and windows that get stuck or won’t open and close properly. Cracks forming along the inside walls. Shifting of interior piers can be evidence of water leakage. Shifting can occur if exterior piers begin sinking into the ground. Don’t panic if you see a crack in one your walls or the foundation of your home. Cracks don’t automatically mean your house is going to cave into the ground. While they can sometimes be a sign of a larger issue, cracks are often cosmetic and easy to fix. If you do notice a crack, take a good look at it to determine if you need to call an expert. Hairline cracks are small cracks that are up to sixteenth of an inch wide and are usually due to concrete shrinkage. They can appear when concrete cures unevenly. Oftentimes, they’re not worth worrying about, especially if they appear in the mortar between bricks. A little waterproof concrete paint will usually fix these types of cracks, but check periodically to see if the paint itself is beginning to split, as this can be a sign that the crack is widening from pressure. Cracks in an L-shaped section of concrete are often from the concrete curing process as well. Frequently seen in foundations that step down to a hillside, these cracks are usually just signs of general shrinkage, not of a deeper issue. Plugging these cracks will prevent water from seeping into your basement or crawlspace. Stair step masonry joint cracks are a more serious concern. Take note if the wall is also bulging and the crack is a quarter inch wide or larger. Joint cracks of this variety often denote pressure on the wall from an outside moisture or gutter problem. Horizontal cracks are probably the most worrisome ones you’ll These are often caused by frozen soil expanding and breaking into the foundation. They can mean big trouble for the overall structure of your home. If you discover that a horizontal crack is spreading across your foundation, get a free estimate immediately to assess the damage and discuss repair solutions. Some of the problems we’ve talked about here are relatively cheap and easy to fix. If you do encounter a structural issue that’s related to your foundation, there’s no need to assume that you’ll need a total replacement. In fact, you might even be surprised at the low cost of many foundation repairs. The most important thing is to address foundation issues as soon as they appear. The problems you discover might not be catastrophically expensive to fix, but they won’t go away on their own either. These sorts of structural issues only get worse over time and even a little hesitation can prove very costly. A few hairline cracks might only be a cosmetic problem, but some foundation issues can threaten the structural integrity of your entire home. Horizontal or joint cracks typically require the help of an expert, as do uneven floors and bulging walls. There are many misconceptions and myths about expensive foundation repairs. These myths typically take one of two forms. The first says that foundation repair is always outrageously expensive, no matter what problems they’re intended to fix. The second type of myth tells us that most structural issues require a brand new foundation. Fortunately, these are usually false statements. Oftentimes, the foundation is not even the problem. And when environmental stress does damage your foundation, the issues can often be resolved very cheaply, without the need for a total replacement. But if joint and horizontal cracks are present, your floors seem uneven, or there are bulging walls and water in your basement, you may need to get an experienced expert’s opinion. Only these types of professionals can be trusted to address problems this severe. Often, the foundation repairs that you actually need are much smaller than a complete replacement. There are cases in which a complete replacement is necessary, but this does not mean that every foundation repair has to be major. To sum up, there is absolutely no reason to let fear turn your home into rubble, not when expert help is only a phone call or a click away. Schedule a free estimate today to save your foundations and maintain the structural integrity of your home for many years to come. I didn’t realize that a lot of insects in your basement could be a sign of foundation problems! My wife and I have recently seen way more insects than normal in our basement. We will have to check out our house and see if there are any other signs of foundation problems. Thanks for the information!